Inventory Management Software Market size is set to exceed USD 3 billion by 2024; according to a new research report by Global Market Insights, Inc. 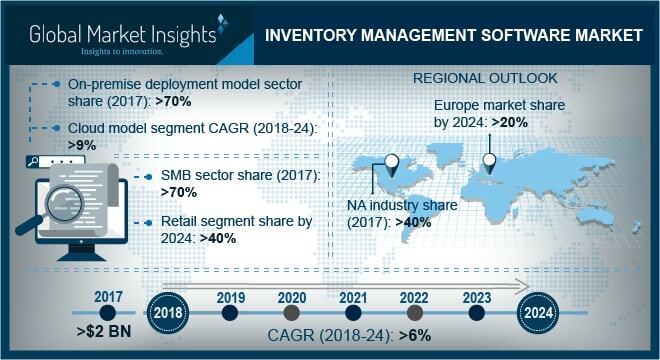 The inventory management software market growth is attributed to the rapidly growing global e-commerce landscape, retailers emphasizing on offering omnichannel shopping experience to their customers, and the increasing manufacturing output due to the adoption of Industrial IoT (IIoT). Inadequate supply of inventory may grind manufacturing operations into a halt. On the other hand, the excessive supply of inventory can cripple an organization’s cash flow and pose a threat to its liquidity position. Either way, inefficient inventory management in manufacturing organizations can create serious challenges for the productivity of the companies. Hence, the demand for robust inventory management solutions in the manufacturing sector is expected to increase consistently over the forecast timeline. The advanced radio frequency system (RFID) segment in inventory management software market is projected to register an accelerated growth during the forecast timeline with an impressive CAGR of around 11%. The technology allows supply chain managers to identify individual products and components and to track the movement of the inventory throughout the supply chain right from the manufacturing unit to the point-of-sale. The systems are used for ensuring stock security, quality control, and for the prevention of over-stocking or under-stocking of products. The inventory optimization application is anticipated to exhibit a lucrative growth at a CAGR of over 9% between 2018 and 2024. Inventory management systems enable effective inventory optimization by allowing organizations to reduce inventory by a considerable percentage to free up working capital from unnecessary inventory buffers. This also facilitates reduced inventory carrying costs and increased customer service performance. The cloud model is projected to acquire a inventory management software market share of over 35% by 2024. The market growth is characterized by increasing awareness regarding the benefits of scalability, flexibility, and enhanced security offered by cloud platforms. SMBs can save significant costs on capital investments by opting for cloud-based inventory management software without the need for procuring dedicated hardware and software resources. Also, cloud providers offer pay-as-you-go services to their customers, allowing them to scale their usage of inventory management systems dynamically with respect to the changing market demands. The large organization market is projected to register an impressive growth over the forecast timeline with a CAGR of over 8%. Large enterprises invest significant resources in inventory management systems to ensure uninterrupted supply of inventory throughout the supply chain for avoiding any production or distribution losses. The solutions enable such businesses with large volumes of inventory to efficiently track the products at every stage. Companies operating in the global inventory management software market are focusing on technology innovations, strategic acquisitions, and mergers to strengthen their market position and to acquire new customers. For instance, in April 2018, SAP SE acquired Callidus Cloud Software, Inc. at USD 36 per share in a cash deal. This acquisition will strengthen the position of SAP in the inventory management market by integrating advanced CRM and sales optimization capabilities of the Callidus Cloud into its inventory management system. Similarly, in 2016, Oracle acquired one of the leading vendors of the inventory management software, Netsuite, to strengthen its market position and expand its customer base. Some of the key players operating in the inventory management software market are Ordoro, Fishbowl, Zoho, Oracle, Microsoft, SAP, Stitch Labs, Dapulse (Monday.com), Dearinventory, Brightperal, TradeGecko, Orderhive, Handifox, Veeqo, SkuVault, Megaventory, Wasp Barcode Technologies, Acctivate, Sage, Manhattan Associates, and KCSI.